The inaugural BOLT Asset Management Hackathon was held in Brisbane on Friday 26th October at the Gabba. The multidisciplinary teams collaborating on asset management challenges included engineers, accountants, lawyers and data scientists. A number of QUT PhD candidates also attended the event. 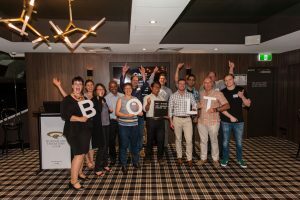 BOLT is an initiative of Dr Monique Beedles, the Asset Institute’s Queensland Division Director and Professor Joe Mathew was the judge for the day.